EVERY bottle of alcohol in Australia will soon have to carry pregnancy warning labels on them, after seven years of lobbying from health ministers. 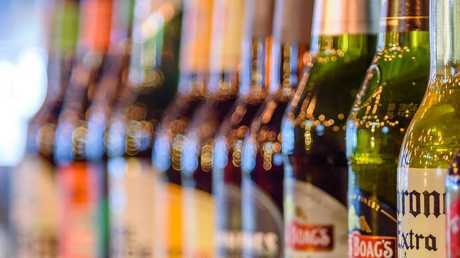 Alcohol companies were given a seven-year window to introduce the labels of their own volition in 2011, with currently only 75 per cent of bottles featuring the tag. But after a deal agreed by Australian and New Zealand ministers, it will soon become mandatory for all bottles to have the label. It will include a pictogram and a warning statement developed by Food Standards Australia New Zealand (FSANZ). Foundation for Alcohol Research and Education chief executive Michael Thorn told The Daily Telegraph the decision is welcomed, despite taking seven years. "This is a win for consumers and a critically important decision that will save lives and the pain that is caused as a result of what is a preventable but lifelong disability," Mr Thorn said. He said too many women are unaware of the "life-threatening risks" of drinking while pregnant but the introduction of a mandatory label will keep them up to date. Brewers Association of Australia CEO Brett Heffernan told the publication he too fully supports the move and said his industry was already 100 per cent compliant. All alcohol bottles sold in Australia will have to warn against drinking while pregnant. "While it is disappointing that mandating pregnancy labelling for all packaged alcohol products is necessary, today's decision by Ministers is a no-brainer. We fully expected this outcome," he said. He is however perplexed as to why others in the industry failed to heed the writing on the wall since 2012. "The three major brewers got the job done, across hundreds of product labels, in just two years." According to the not-for-profit website FARE, alcohol harm in Australia is significant. "More than 5500 lives are lost every year and more than 157,000 people are hospitalised making alcohol one of our nation's greatest preventive health challenges," the website states. While there is no safe level of alcohol consumption during pregnancy to reduce the risk of neurology disability, it's estimated almost half of women drink while pregnant. Daily Mail reported that a study published in the British Medical Journal found the number of women who drink significantly drops in the second and third trimester, suggesting many drink early in pregnancy, before they know they are pregnant. No timeline has been set for the change but ministers want it to come into effect as soon as possible.